Well today is the last day of #Crocktoberfest 2013 and I am saving the best for last!! Today’s mission was to make a dessert in the Crockpot. To be honest I never made dessert in a Crockpot, but I couldn’t wait to try it out. I figured for my first dessert I would go with simple, flavorful and totally Fall themed. Are you thinking apples? You know I am! 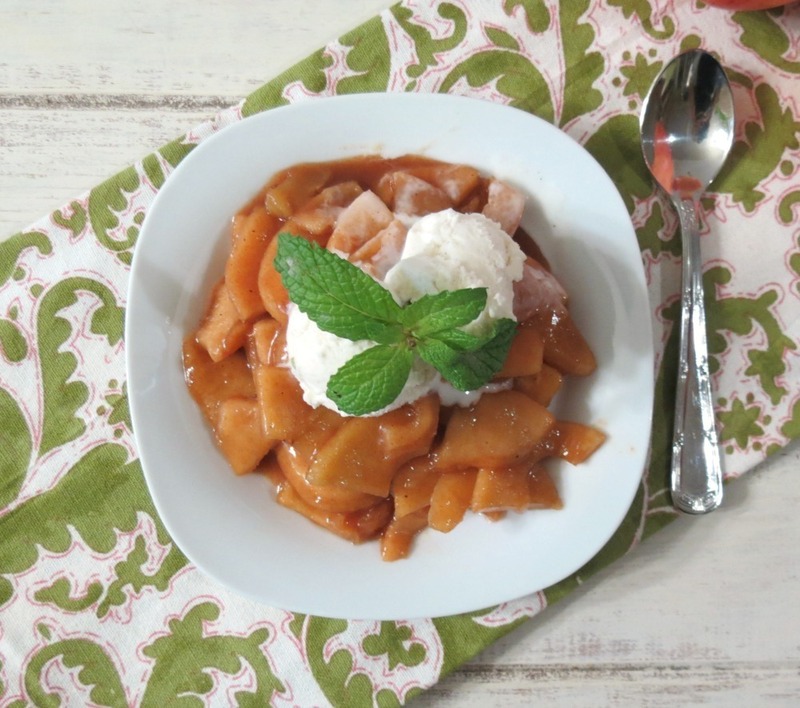 I thought I would make a healthy caramelized apples in the Crockpot and oh my gosh what a treat this dessert is! I’m drooling thinking of it!! 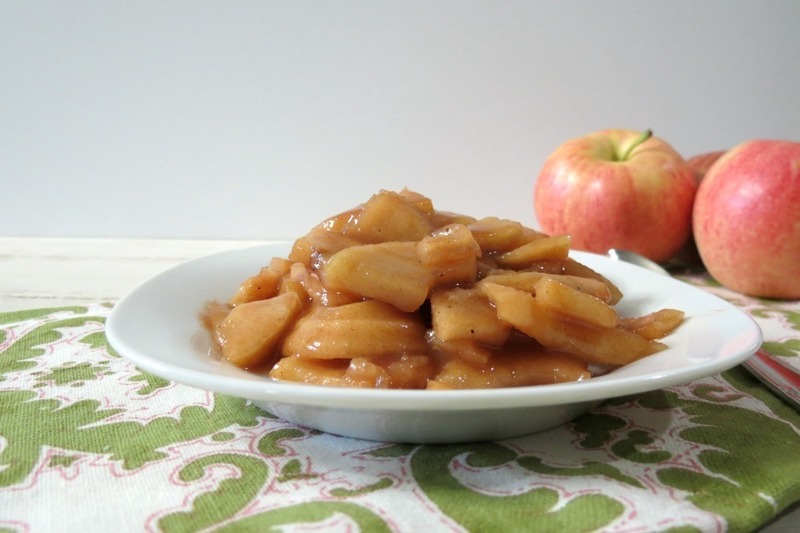 Oh my if you have never made apples in the Crockpot you simply must!! The apples are tender, sweet and tastes just like an apple pie without the crust. I love the taste of cinnamon and sugar together and on apples, it’s simply amazing!! This is one of the best Fall desserts I have ever made. Not only are the apples so sweet, but the sauce is friggen incredible!! I could just drink it!!! This is so perfect for a Fall dessert or even to side with a pork dish. For the photos I topped with vanilla bean ice cream, but I have also added it to my yogurt and oatmeal. 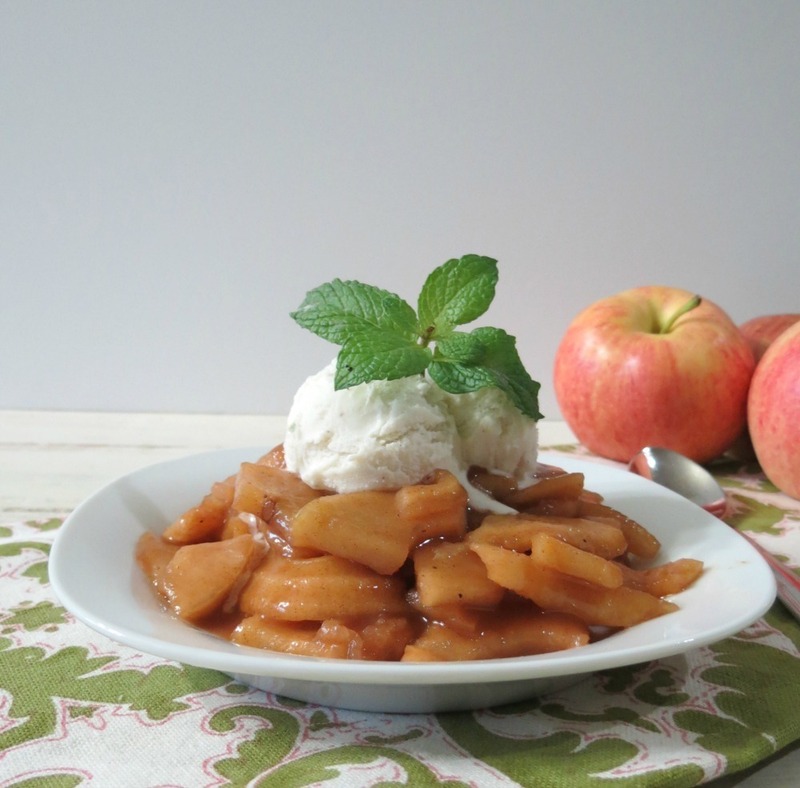 There are so many things you can do with caramelized apples. Eat it cold, warm it up, top in toast, put it in a taco shell, make a parfait. I could go on and on. However my favorite way to have it with warmed up and just a dollop of ice cream. I am so making this again and soon! Next week I’m going to Apple Hill, and I plan on buying a case of apples! I also took the next day off from work so I can make lots of apple goodies. 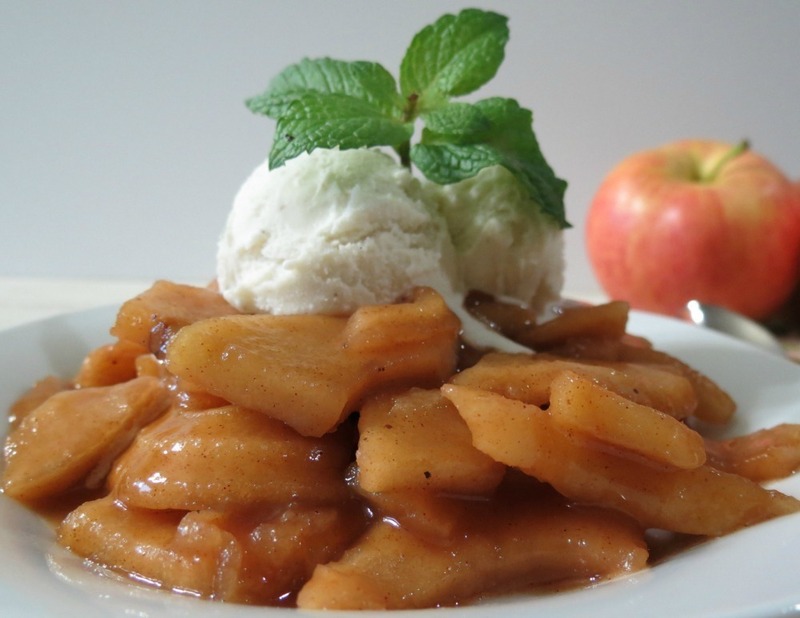 I know I will be inspired and so excited to make apple dishes and believe you and me, this is one I’ll be making right away!! So I hope you like apples because the recipes will be coming soon!! Last year when I went to Apple Hill I picked up an apple peeler, but it slices the apples kind of funny, that’s why the shape is not in perfect slices, but this made it so fast for cutting and peeling. But no matter what way you cut the apples, they will taste perfect. Oh and for the apples I used Fuji apples for this recipe, but honestly I think any apple you like will work. To make I used almost 6 apples, I ate half of one. 🙂 I cut, peeled and cored them and place in a Crockpot. I added lemon juice, cinnamon, apple cider, stevia, only 1/4 cup brown sugar and a pinch of cornstarch to thicken it up. The apples really thicken up once cooled. I think this is a pretty healthy dessert and even though the sugar content is high, it’s only because apples contain natural sugar. So don’t let that scare you away! This is a way to have your apple pie without all of the calories!! I didn’t miss the crust on this recipe at all! 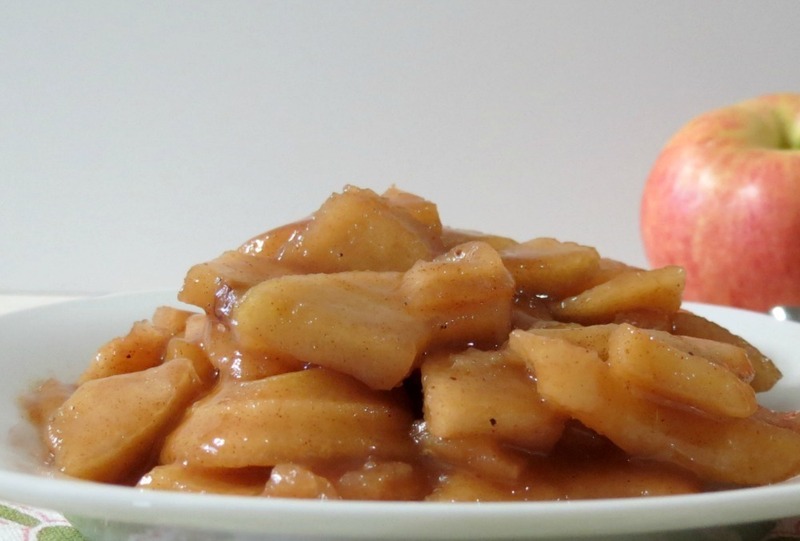 Healthy, low calorie slow cooked Fuji apples,marinating in a sweet sauce made with apple cider, brown sugar and spices. Spray the inside of the Crockpot with cooking Spray. In the bowl of the Crockpot, add apples, lemon juice, cinnamon, nutmeg and sugars. Mix until mixture is all over the apples. In a measuring cup add apple cider and cornstarch. Pour over the apples. Set the apples on low and cook for 3 - 4 hours until apples are tender. Half way between cooking time, stir the apples. I just LOVE this dessert!! I’m still drooling! I think this is one that should go on everyone’s Fall dessert rotation. I stored my apples in a mason jar in the fridge. They should last at least a week. For me, they lasted two days. So good! I wish I had a big bowl right now! Well I hope you enjoyed the Crockpot recipes this week from me and my fellow bloggers. I really love using my Crockpot and after this week, I plan on using it more. I’ve teamed up with some of my friends to bring you a great list of slow cooker dessert recipes today! There are 10 scrumptious recipes to check out today. 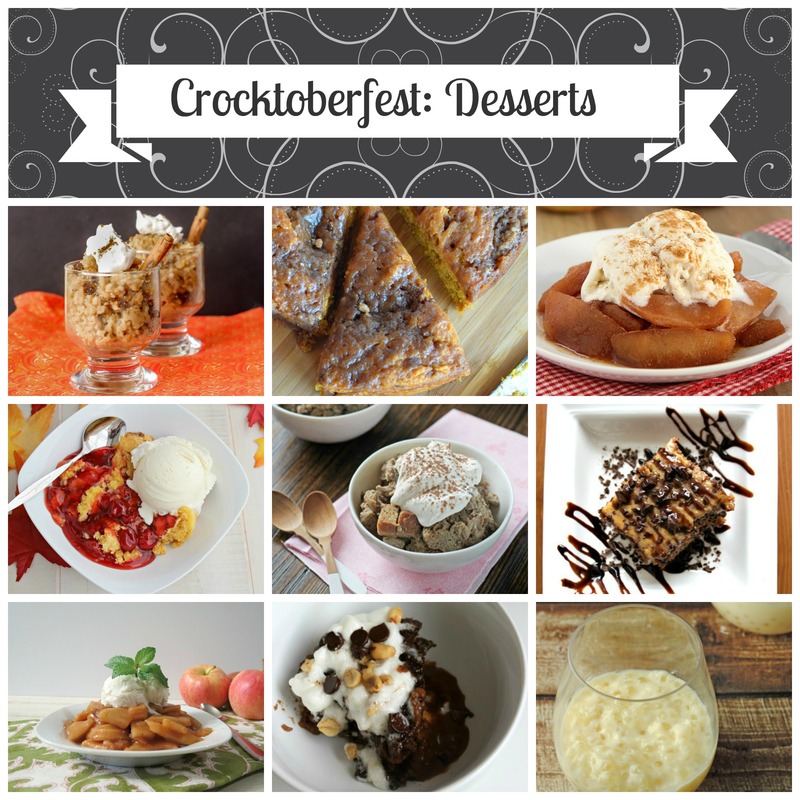 If you love slow cooker dishes then check out #crocktoberfest2013 on facebook, twitter, and instagram to find all the other recipes that were shared this week. I love this idea of making them in the crockpot! And I especially like the idea of adding some to yogurt or oatmeal in the morning – sounds awesome! Happy Friday! Thanks Ashley! Happy Friday to you!!! These apples are crazy good in yogurt and oatmeal! I’m making this again this weekend! Thank you for this! I’m going to try this tmw – the house smells yummy I bet!! Oh my gosh the smell is amazing! Your going to just love the slow cooked apples!! Thank you Romona! It’s so simple and oh my gosh I just love it! Great minds do think alike! These look so good! Hi Jennifer! 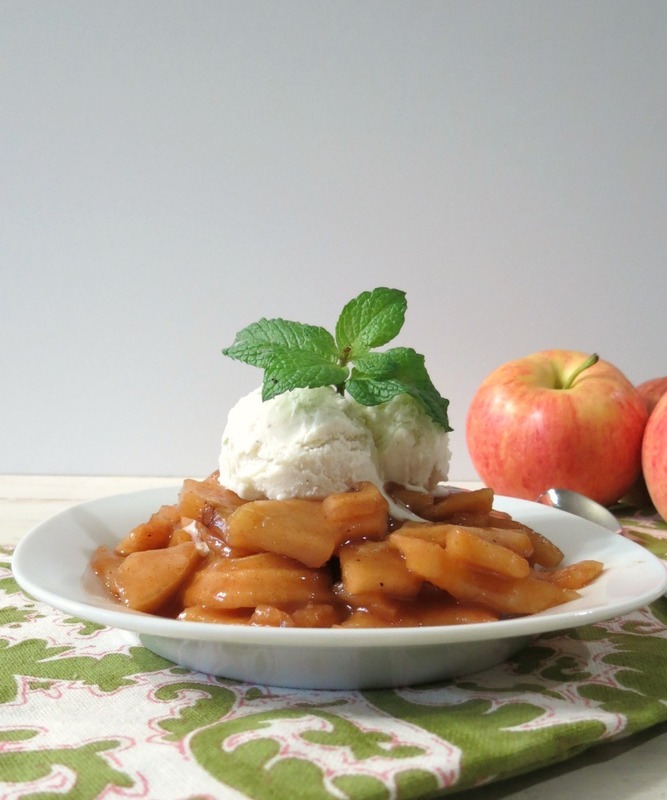 I just received a small bag of apples today that will work perfectly for this recipe! So glad I found it! Thanks for sharing! Happy Fall! Blessings from Bama! If you bake circle of pie crust or a circle of puff pastry on a cookie sheet, transfer the cooled pastry to a serving plate, then place the caramelized apples on top, you have a perfect Tarte Tatin. Great idea Louise! I love that!!! I was really looking forward to the taste but I the vinegar made it impossible to eat. Was one cup correct? Could something be substituted? Okay .. I am having a good laugh. For reasons unknown in my brain I read apple cider as apple cider vinegar. I even looked back at it several times and my brain did not see the correct thing. Thanks for answering. Cider makes more sense and maybe some new reading glasses.